Some cold dessert for the warm weather? Ice jelly is commonly found in dessert stalls especially those located in the food centre or hawker centre in Singapore. However, those served in the food centre are usually plain ice jelly. 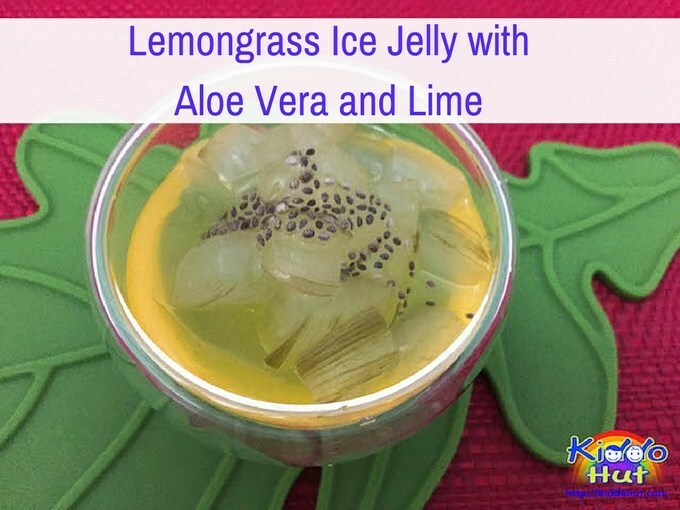 For this lemongrass ice jelly with aloe vera and lime, you can get it in some restaurants. But, I find that their lemongrass aroma isn’t strong and often or not, they do not served with aloe vera. So, why not make it at home? So, why I use aloe vera as topping? What is so fantastic with aloe vera? Aloe vera is often used in traditional medicine as a multipurpose skin treatment and aloe vera is used on facial tissues where it is promoted as a moisturiser. Cosmetic companies commonly add the aloe vera sap or its other derivatives to products such as makeup, moisturizers, soaps, sunscreens, incense, shaving cream, or shampoo as <review of academic literature notes that its inclusion in many hygiene products is due to its “moisturizing emollient effect”> source from wikipedia. When you treat the aloe vera, be very careful as it has thorns on the side and this fruit is slippery. And, candied aloe vera added to the plain ice jelly is really refreshing. Plus a bit of lime juice will definitely perk you up if you are feeling tired or hot. Although the ice jelly powder already has sugar as one of its ingredients, it is bland and tasteless. So, I have added some rock sugar and it is good to eat on its own without toppings. As I do not have ice shaver at home, I make do without shaved ice and still, it is a refreshing dessert. Give this easy recipe a try! 1. Boil 1.7 litre of water, add the pounded lemongrass and sliced ginger. Cover the pot and let it simmer for 15 minutes. Add 250g rock sugar to taste. It will taste sweeter than it would be after mixing with the ice jelly powder. 2. Measure out 1.5 litre of lemongrass tea. Top up to 1.5 litre if inadequate. Cool it down. Use the balance (if any) to soak Chia seeds. 3. Soak Chia seeds for 30 minutes. 4. Boil the cubed Aloe Vera in water for 15 minutes and drain. Put 3 tablespoons of sugar in a bowl. Toss the cooked aloe vera in the bowl of sugar and set aside to let the aloe vera steeps in the syrup. The longer the aloe vera is steeped in the syrup, the sweeter it gets. 5. When the 1.5 litre lemongrass tea is cooled, pour in the ice jelly powder and stir to dissolve. Bring the lemongrass jelly mixture to boil. 6. Once it is boiled, remove from heat. Pour it into moulds or bowls. Leave in fridge to set. 7. 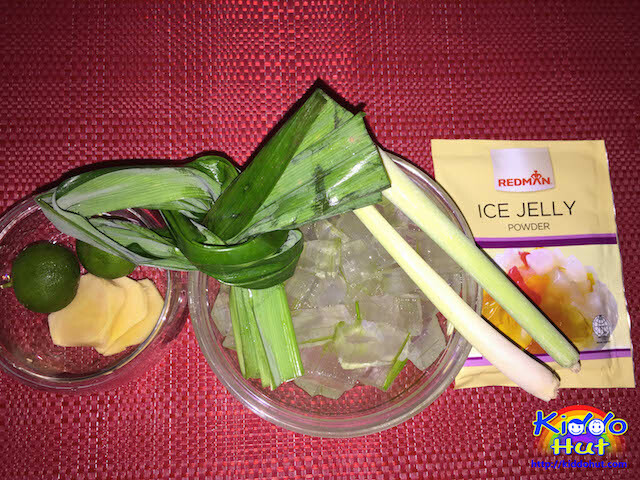 Shave a bowl of ice (optional), add the ice jelly and put the candied aloe vera on top of the jelly. Add some soaked chia seeds and lime juice. Serve. If you do not have shaved ice, you may serve without ice. It tastes equally nice! If you have enjoyed reading this article, do like my Facebook page to get more upcoming fun and informative articles. You can also follow me on Twitter, Pinterest , Google+ and StumbleUpon for more updates. Thank you for visiting Kiddo Hut! Copyright 2012 - 2017 Kiddo Hut unless otherwise stated. All rights reserved. You may not reproduce text excerpts or images without my prior permission.